On Thursday, January 3rd we’ll be celebrating Lauren’s swearing-in to Congress and officially opening our DC office, and we’d love to see you there! RSVPs are required for security and planning purposes so please let us know if you’ll be joining us. On the final two days of her campaign, Lauren is visiting all seven counties of the 14th in an Airstream trailer. Stop by our campaign headquarters to visit with her as she travels from north to south! On the final two days of her campaign, Lauren is visiting all seven counties of the 14th in an Airstream trailer. As she travels through McHenry County, join her for a conversation with Sun City retirement community residents to discuss the issues they care about most. On the final two days of her campaign, Lauren is visiting all seven counties of the 14th in an Airstream trailer. Before you head out to knock on doors, join Lauren for a visit in our Woodstock offices! On the final two days of her campaign, Lauren is visiting all seven counties of the 14th in an Airstream trailer. She’ll be stopping by Fox Lake to thank volunteers; come say hello before hitting the streets or phones! On the final two days of her campaign, Lauren is visiting all seven counties of the 14th in an Airstream trailer. Come say hello before starting your canvass in Gurnee! 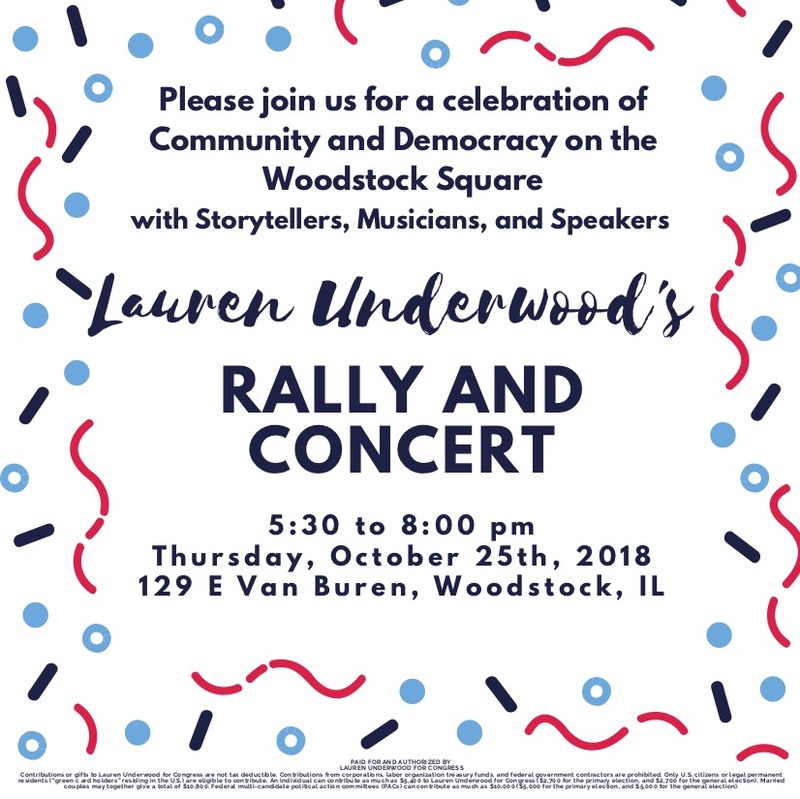 Join Team Underwood for a campaign concert in support of Lauren Underwood with musical guest CAKE! Costumes are highly encouraged! Join Vice President Joe Biden at his rally to support Lauren Underwood, the congressional candidate in Illinois’ 14th District, Oct. 31st at the Kane County Fairgrounds. Biden and Underwood are encouraging her supporters to cast their ballots early -- early voting is already underway in Illinois. GOTV VIP: Help Get Out The Vote between Saturday, November 3rd and Tuesday, November 6th to get priority access to a special viewing area at the rally. To be eligible, volunteers must have signed up for at least two canvassing or phone banking shifts scheduled between November 3rd and November 6th. GENERAL ADMISSION: Simply register at http://bit.ly/biden4underwood for general admission. On October 25th, Lauren Underwood, Jack Franks, speakers, musicians, and supporters will rally on the Woodstock Square to talk about the issues, the importance of this election, and the power of your vote! Join Team Underwood for a pre-rally fundraising reception. Enjoy light appetizers and drinks before heading to the Woodstock rally! Join us Thursday morning at Fox Point for a Meet & Greet with Lauren Underwood, a discussion of the issues at stake this election and a chance to ask her questions. Featured guest Jill Howe shares her story of a real life dinosaur hunt in South Dakota last year. Special Guest Lauren Underwood will tell a true life tale. And host Will Tremonte shares the sequel to last month’s true Chicago tale from his families past! Join us for a fundraising reception with Lauren Underwood at Primo in Gurnee! Please RSVP at https://secure.actblue.com/donate/oct2218. Hosted by Byron Miller, Leah Goodman, Ellen Bales and Connie Schmitt. 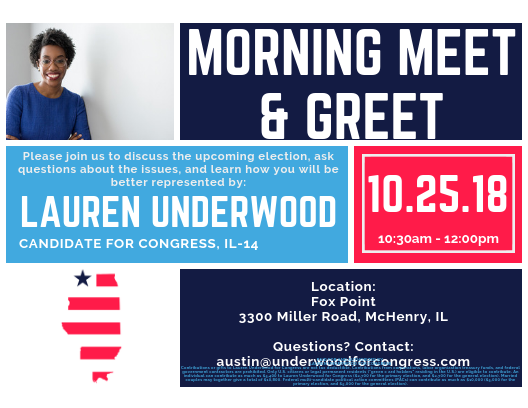 Join the McHenry County Democrats and Lauren Underwood for a Morning Coffee & Talk at Firehouse Depot Coffee Shop. It's the 31st Annual Autumn Drive through Woodstock and Marengo! As the leaves turn yellow and the temperature drops, we will be celebrating the season, talking with folks about the election, and finishing with a bonfire! Along the Autumn Drive route, Team Underwood will have a table and tent set up during the day at the Janko residence. Please bring food to share. Afterwards, the bonfire ignites at 7 pm. So come on out, join us for food, friends, fire, and a fun time! Democratic nominee for Congress Lauren Underwood (IL-14) will be joined by Illinois Sen. Tammy Duckworth. The two women will discuss issues impacting veterans, working families and Lake County’s local economy. Please join us for Lauren's last reception in Chicago! For tickets, please visit https://secure.actblue.com/donate/16oct. The Woodstock Office is up and running! Join us with Lauren, Indivisible NWIL, McHenry County Democrats, and other supporters for a Day of Action as we call and canvass voters in the area. Please join hosts Christine and Carl Schirtzinger, Ed and Linda Cave, Tara Osborn, Scott Rusch, Linda Murphy, and Joe Baron for an evening reception with Lauren Underwood. RSVP at https://secure.actblue.com/donate/13oct. Please join hosts Krystina Haas and Gail Haas for a reception and Q&A to get to know Lauren Underwood and why she wants to represent you in Congress. Appetizers, desserts, and refreshments will be served. This is a free community event. Please RSVP at https://secure.actblue.com/donate/0905. Join Team Underwood at the Chicago March to the Polls and help us grow our movement! We will be in the Voter Village signing up new volunteers for text banking, phone banking, and canvassing. This is a great opportunity for our Chicago-based supporters to help out without having to trek out to the 14th! 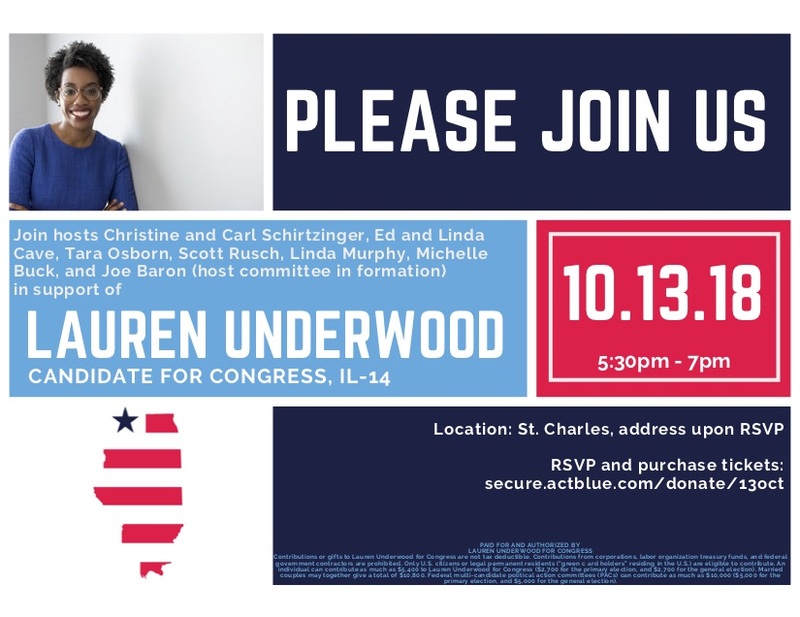 Join hosts Sarah Miyata, Stephen Weber and Katie Garner for a fundraising reception in support of Lauren Underwood for Congress! For tickets and location, visit https://secure.actblue.com/donate/12oct.